This weekend we celebrated this "sweet" gal's birthday. She's my pride and joy and my first born angel. Amber has a knack for lighting up a room with her smile and her enthusiasm. She was pretty surprised when she got a gift from our two dogs, Annie and Jersey, and our cat, Bailey. They are very thoughtful animals and thought she might like some gluten free crackers to snack on. Happy birthday Amber! Amber loves tradition and every year she has chocolate pie instead of cake for her birthday. She also likes pot roast for dinner on her special day. I should have had this giveaway a few posts back when I hit my 300th post, but instead I'm doing a Valentine Giveaway. Leave a comment on this post by Monday at 6pm to be entered to pick a Valentine print of your choice from my Etsy store. You can view my Valentine prints at my store by clicking here. Come back to this post and leave a comment telling which Valentine cupcake print you would choose if you win. I will need to be able to contact the winner so make sure to leave a link or an email address. Happy Birthday to your sweet daughter, she does have specific tastes for her birthday celebrations doesn't she. I'd love to be entered into your Valentine Giveaway, and I love them all. But the Chocolate Cupcake, well that's just me, I'd have chocolate instead of anything. If you haven't yet entered, please read my One World One Heart posting and enter your name there to win one of my giveaways. And if you have already entered, good luck! Happy birthday, Amber! Your momma is so proud of you and I can definitely see why! You have such a lovely smile! Congratulations on 300 posts, Cathie! I am not quite there yet, but it is quite an accomplishment! I love the LOVE cupcake with the little rosette on top! Too precious. How sweet, no pun intended LOL.I have to pic the one with the word love across the top...its the chocolate one.Its in your banner. Sorry its not the one in your banner cause that says Valentine.But they all are so cute, I love the one with love though. What a wonderful giveaway! Your cupcake prints are too cute and so fun. 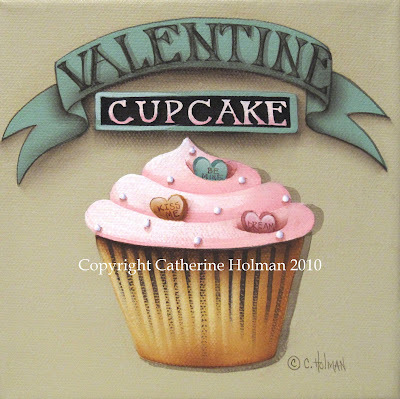 My favorite is the...Be Mine Valentine Cupcake Print! I just bought some red polka dot cupcake holders last week...I'm making white chocolate chip cupcakes for Valentine's Day. Please wish Miss Amber a Happy Birthday from all you Bloggy fans....so happy to see you posting once again!!! You really captured Amber's enthusiasm with that photo...she's got a great smile! to be my choice if I should be the lucky winner! I LOVE the chocolate "love cupcake"! OOOOOOOH, I'd be so excited to win one! Sign me up please!!!!! I am the first to conmment! The "Valentine cupcake" with the pink hearts! Both tug at my heart strings! Happy Birthday Amber!!! I love pot roast too! Happy birthday to Amber! She's a gal after my own heart...pie instead of cake. Oh, count me in. Are you wanting the word out or is this for your readers only? I'd love to announce for you on my sidebar. Happy Happy Birthday Amber. You are exactly right she lights up each and every room. She has such a wonderful soul!! I love each of your valentines prints and would be thrilled to have one in my house!! Oooooo,I would love the "Love Valentine Cupcake" one...so pretty! Your daughter sounds alot like me -I prefer blackberry cobbler for my birthday instead of cake :) Each of your cupcake paintings is so unique and each one makes me smile. If I'm the lucky winner of a Valentine print, just surprise me - I love them all! I would choose the "Be Mine Valentine" print. What I love about it is that it so gently combines the simplicity of a cupcake with just enough touch of elegance in the encasement of glass. It simply says, "Be Mine" and sealing it in the glass implies "forever". My husband and I will celebrate 20 years of marriage this year and this print makes me think of how I want our marriage to be simple, yet still have just enough of those elegant touches that will make it last forever. Thank you for sharing your talent of blending simplicity with elegance with all of us! Happy Birthday to Amber!! She does have a sweet smile. I'd love to be entered in your Valentine Giveaway, Catherine. I like the Be Mine Valentine. How wonderful, a giveaway from my favourite teacher (hihi. I love all your cupcakes but the chokolate one with the polka-dot "Love" writing is so beautiful. So please count me in. Even when it is late, a happy birthday to Amber. Happy Birthday to your daughter! I like the LOVE chocolate cupcake with the Be Mine banner... I could display it all year round :) plus, it is sweet to look at and a calorie free chocolate fix as well. Congrats on 300 posts too! What a sweet Valentine treat for someone to receive! Happy Belated Birthday to your daughter too. I hope your daughter had a wonderful birthday Cathie! I love chocolate pie too! I would love to be entered in your Valentine Giveaway! I love the Valentine Cupcake you made this year. Thanks for having this giveaway and I hope I win!! I always enjoy your blog so very much. Hope your daughter has a wonderful birthday. Please enter me in your Valentine Giveaway. I would gladly take anyone of them but my favorite is the one with the little rose on top. Everyday White Cupcakes with Chocolate Frosting Folk Art Print". I would give it to MY daughter- it would look delicious in her kitchen! Our daughter turns 19 on Wednesday. Where does the time go? Thanks for entering me in your drawing. It is too hard to pick which one. I love them all. What a Wonderful Give Away! I would pick the Love Valentine Cupcake. It is lovely! Happy Birthday to your daughter. She reminds me of my oldest....very, very specific. I love the I love you cupcake. Hmm...weird sentence that. I am going to move you into my sidebar. I need to visit your blog much more often then I have been! Happy Birthday, Amber! We have gluten-free birthday's at our house too! I hope your day was awesome! I looked through all the prints and had such a hard time choosing a favorite. Finally, I decided upon the tea room "Simple Pleasures" picture because I love afternoon tea and everything about it. I just love all of them...My apt. looks like I am having an art exhibit of Catherine Holman..Which I love, as it is so warm and homey...Linda K.
I would love any print of yours...My apt. sort of has the Catherine Holman touch to it...I love so much....It is warm and cozy....Linda K.